So yesterday I inspired myself with my picture of our tree. I have decided to keep the festive feel here at jen prouty photography and thought I would post one pic a day of some of my favorite ornaments.......each one has a story to tell! So grab a mug of hot cocoa, a glass of wine, and check back every evening to spy on my christmas tree! 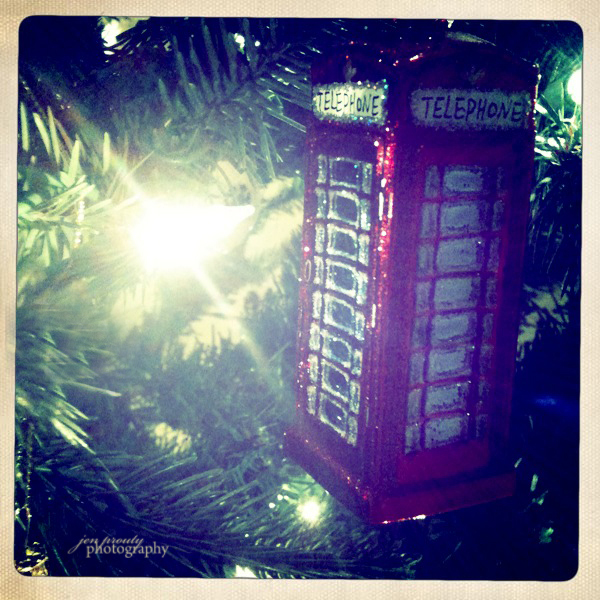 Today's ornament: classic phone booth from England. Story: 6 years ago. First leg of our honeymoon...London. Me? Smitten. With everything. The pubs, the amazing pints of ale, to-die-for fish and chips, the accents, harrods, the underground, Tate Modern Art Gallery, the old fashioned taxis, vending machines in pubs you could buy little cans of olives (which i did just because i could), guards that never smiled, the people, the quaint parks, even the london bridge (as touristy as it was...smitten), and yes the charming, apple red, phone booths that just begged to be photographed. Trip of a life time....oh yes, and speaking of smitten, I should also mention smitten with my husband! 6 years later, hanging this ornament on my tree...smitten as ever.